Disclaimer: I was given products in this post for the purpose of review. I am not paid to write this review. All opinions are my own. My kids are the Emoji kings lol. When I type my sister a message on facebook they are both begging to insert an Emoji.... My sister still tries to forget the day we sent 20 poop emojis. My kiddos were not happy with her for getting sick and canceling their sleepover. They do love putting these cool little symbols in messages and now thanks to Crayola they can write hand written notes and add Emojis! As many of their little heart desires. Sometimes they don't even use words they just write an Emoji letter. 2) It helps kiddos be creative. Brandon jr wrote me a letter and instead of writing dog he replaced that with the paw print Emoji. Instead of saying love he used the little heart. I loved seeing just how creative he could get in his letters. 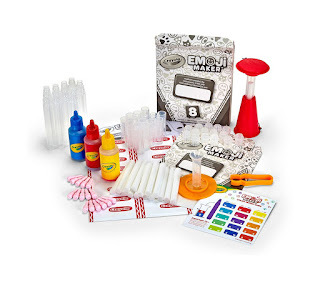 3) This set is by Crayola so you just know the colors are high standard and very bold/bright! The only thing I wish was a bit different is I wish they would give you different size marker. I think it would have been neat to have big Emoji's, small ones, medium ones. 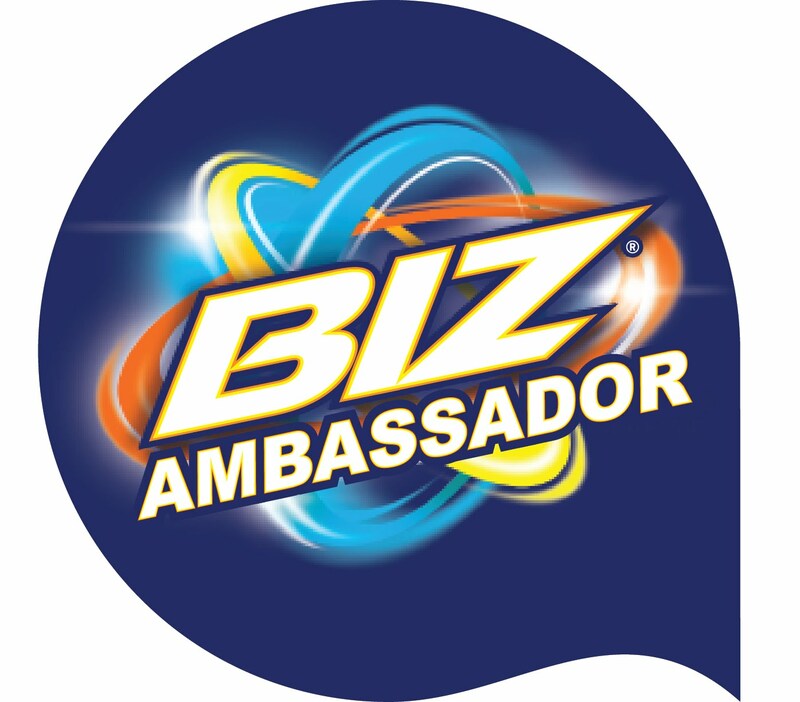 And since we are talking about an amazing brand let me tell about product Crayola will be offering this holiday season! 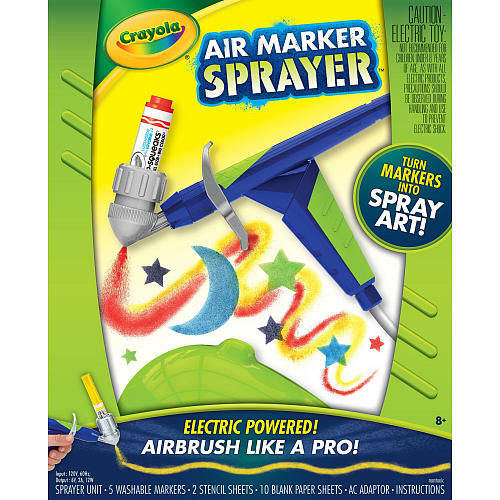 Crayola Air Marker Sprayer: Kids can airbrush like the pros with Crayola’s Air Marker Sprayer. Compatible with all CrayolaMarkers, this tool creates high quality art that can be used in tons of different ways. Stencils and Markers are included. I LOVE the fact it is compatible with all Crayola markers! My Quinn is quite the crafter, when I use to pick him up at preschool his bin was the only one over flowing with papers. One day his teacher told me that when the rest of the kiddos play he sits and does art. That is what he wants to do. At home to we have a whole art area set up just for him so he can draw, color and paint his little heart out. 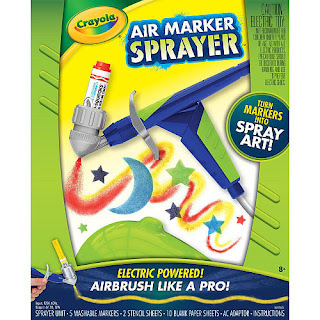 So for me this Crayola Air Marker Sprayer gets two HUGE thumbs up. It will last us for a very long time, I don't need to buy special markers to for it so the overall cost will be low. Now lets talk about the kind of art my boys have been doing. You see Quinn may be my crafty child, but Brandon Jr loves all things wrestling. For his birthday we took him to WWE in Hershey. And Quinn of course loves it too, so they do this cute little thing where they set up their ring get out their tag team guys and then make little signs for me to hold up (I am the audience) to cheer on a certain wrestler. Thanks to the Crayola Air Marker Sprayer my signs look better then ever before! This is a def. must have toy this holiday season!